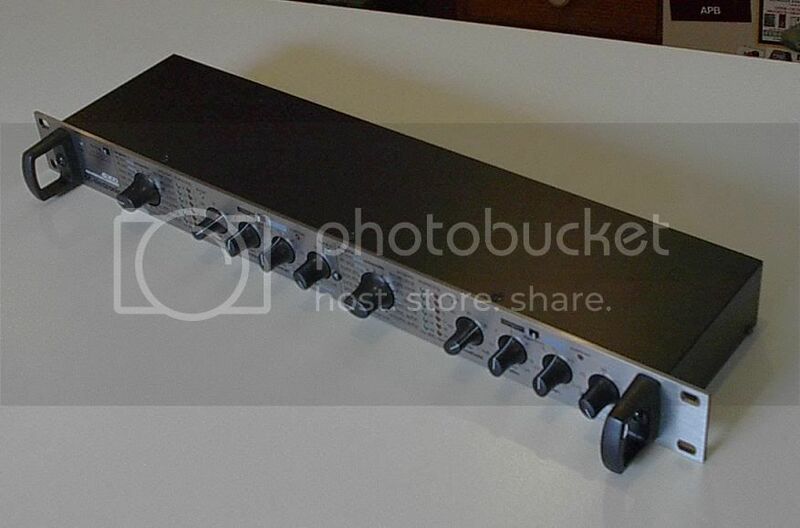 I suspect most of you have seen and/or heard the sub-$200 silvery M300 effects processor from TC Electronic. To flesh out their affordable line they've recently introduced the C300, a dual compressor/gate with the same 1U form factor and set-and-forget multi-knobbed user interface. Naturally, I had to play with one, so I called up TC and asked if they had any to spare. A week later, lo and behold, I received a small package. There's two channels of that, either of which can be a gate or a compressor. Choose a preset, set your threshold and ratio, and that's pretty much it. Like the M300, the unit purposefully takes some control out of the hands of the operator in favor of easy and rapid use. Don't let the simplicity or the low price fool you, however. 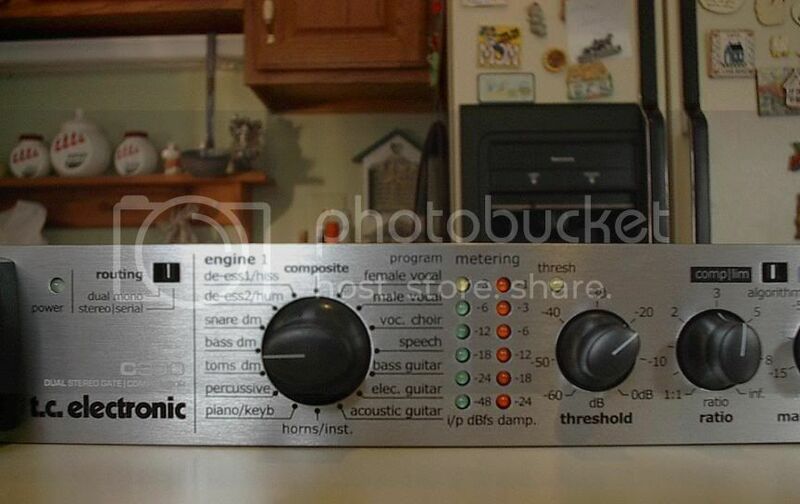 First of all, in most of the modes this is a multi-band compressor. You heard me right. Not only that, it's got the same flexible routing as the M300... it can operate in dual mono mode, or serial mode with the channels linked in stereo. This one unit can therefore be a pair of comps, a pair of gates, an awesome kick channel gate->comp, a subgroup dual comp, or any variation thereof. With only 1.56 msec of latency you're not even going to notice it's digital. So enough about the unit, let's talk about my show. B rig went out with me on Saturday, and I did the whole how-much-can-I-pack-in-a-car trick. Turns out it's quite a lot, but there wasn't much room left over for additional processing or EQ racks. C300 to the rescue. I was pleasantly surprised to find the thing's shallower than a MixWiz, so I can rack it right up in my SKB popup case and even leave the cables in! Heck, if I didn't need that top rack space for my monitor EQ, I could rack up two and have all the comp/gate I need for that rig, ready to go at a moment's notice. I split out the two vocal channels and compressed each one. Took me about 10 seconds to set up. Male vocal preset, threshold at -30dBFS, 3:1 ratio, 6dB of makeup, go! This was a little cushier than real combat audio (OK, I'm kidding, this was easy as hell) but I still appreciated the design of the unit. Very readable, even in the dark. The preset selection switch has a satisfying detent at each position. The meters are large and easy to read... I never had problems determining how much "squish" I was applying, or seeing if I was getting close to clip (which I never did). The show went beautifully. It wasn't exactly a critical listening test, but the C300 made it easy to keep levels under control and even when I was taking 12dB off my vocalists it didn't sound strained. There was plenty of clarity and the signal still sounded dynamic, even though I knew it wasn't. I literally didn't touch either channel of the C300 after my 5 second adjustment at soundcheck. Easy, breezy, beautiful. So I've just boxed up and sent off this unit to Evan Kirkendall, who's going to really beat it up and see what he thinks. At barely more than the price of a new 266XL, it's a bunch more processor and it sounds better too. I'm sorry I didn't try it as a kick channel strip, since I think the gate->comp package in one RU would really have blown me away. Fortunately, I wasn't exactly lacking in punch, so it was great on vocals. I think this product is a real winner at many levels. For the weekend warrior who just needs a comp that sounds good, the price is certainly right. But for advanced users, it's got a lot of power under the hood and has the added advantage of digital I/O. If you want to read more about what each preset does, that's available on page 14 of the manual, which is available here. Thanks for the Road Test, I missed it and thought that you got busy. Eric pointed me to the right place, "Here". As a Weekend Warrior, the C300 might do me some good. Don't tell anyone, but I'm buying two. That and a short 4-channel insert snake is all that stands between me and B-Rig Rock 'n Roll. This should make Flying by the seat of your pants alot more enjoyable! -I practice safe excursion on the weekends. Bennett sent the C300 down to me a few weeks ago. Sadly, Ive only had it out to 1 gig and it was a pretty crappy venue. However, I did use it on kick and was quite happy with the results. I ran it in parellel mode with the gate first then the comp. I was pretty impressed with that this thing could do. It does a much better job then the 266xl. I like the gate a lot more, however the gate does have some click to it on it's fastest setting. It was only noticeable in the phones though. The comp section was pretty smooth and kept the channel out of clipping. But, on a noisy stage with the bass amp 2' from the kick mic it did a great job. I cant wait to get it out to more gigs. I really want to see what this thing can do. Ill post some pics of the unit soon as well. I still haven’t had a chance to get it out of the house much, but it's done 2 gigs on kick. Anyway, gig 2 with it was much easier. Now that I know how to use it, I was much quicker with setting it. I worked it hard too! I was running the input on it all the way up to "-3" and I even managed to clip it from time to time. Didn’t sound like it was being pushed though. Even when you hit “overload” there was no auditable distortion. I also experimented with the gate some more. Using a slower attack gets rid of the clicking, but you also lose some of the attack when used on kick. Basically, it couldn’t keep up with double basing. So, I’m just running it on its fastest setting. However, the gate is a lot better then the dbx 266xl's gate. Since this is a multi band comp, the gate is also limited to whatever setting you run it on. When I ran the 266xl on the kick the snare would make the gate open. This does not happen with the C300. The gate only opens when the kick hits. That was something I really like about the unit. Onto the comp section: I haven’t played around with this too much, but again, comparing it to the 266xl, the c300 wins. I run my kick channel hot, and the 266 wouldn’t catch all the peaks. My kick channel would clip from time to time, even though the 266 was comping. The C300 doesn’t let a peak by! I didn’t clip the kick channel once during both times I used it. More coming soon! I plan on using it on lead vocals, toms and bass guitar over the next few gigs. Ill be running it against my 1046. But wait, how about some pictures? Its a very shallow unit! The C300 is about 3" smaller then the 266xl. This is great if you dont have a very deep rack to work with. Everything is very well labeled! Just flip the big knob to what you plan on using it for, set the threshold and go! Its very easy to use and is basically idiot proof. Also, notice the routing switch. It can be run as 2 seperate units, or 1 gate/comp with the flip of a switch. Ive got to upload the rest of my pics still. So, more coming later this afternoon! PS- If you have an M300 efx unit, dont mount the 2 right next to each other. I found myself chaning the comp. settings instead of the efx from time to time. Thank you both for your reviews! I've been intrigued myself with this product. I've been thinking of going a different route and getting rid of my Presonus ACP88, which I've been for the most part happy with, but now have a bit more real estate in my rack which has me rethinking some things. Price point is quite compelling. Glad to hear that it's decent TC stuff. Have either of you messed with the M300 yet? Yep. We both have the M300's. They are great units as well. PM me if you have any questions. I just (well, a couple of days ago, but I've been busy) finished a one week festival gig that really took my system to the limits and let me explore a little better the capabilities of the C300. What I'm trying to say is that I used the compression sections of the C300 on an extremely wide variety of signal sources, with zero soundcheck or setup time for each act and no possible expectation for consistency between vocalists or instrumentalists. The on the fly adaptability of the C300 really came in handy here... depending on who grabbed what mic for what source, I had the ability to select a preset with a quick flip of a knob and then adjust my threshold and output gain to get an appropriate amount of squeeze on each source. Easy as pie. I was also pleasantly surprised to find how transparent the C300 is even when you're not watching it and your vocalists starts using the mic like they should have 5 minutes ago, the only indication that you're taking 20dB off them is the meter on the device. Extremely transparent, very well thought out presets that really help tame different types of source material and a simple user interface make this box my new go-to for generic mostly-analog-realm compression. Even the metering is a little closer to "pro" than one might expect, with separate overload indication plus threshold for each channel. That, combined with 6-segment LED ladders for input dBFS and gain reduction make it simple to tell what's going on inside the device. I'll say it again: give it a try, it takes the pants of anything else even near the price point, with the exception of the FMR RNC which isn't quite as user-friendly. Did you ever put this particular comp on more important channels like vocals? I'm curious from more than one point of view how it was. I've seen it, just haven't used it. I'm one of those guys who would rather have no compression than a crappy comp. So far I have not been impressed with DBX's stuff the 166s new or old, I think the 1046s are ok... How does it rate compared to them? Or even up to the higher end comps? Would they be something for an A rig? How rider acceptable do you all see these things? Also what happens when pushed really hard? Do they crap out or are they pretty steady? Also, Evan, you stated that you used it as a gate, and you compared it to a DBX266xl's gating function? How does it compare to other gates? ie, Valley People, Drawmer, BSS, etc. ?